This section of “my profile options” is designed to allow a member further control of the visibility of their upcoming travel plans. The distinction being made here is between: “all (free) members” and “my confirmed contacts”. A (your) confirmed contact is a member who accepted your “click” (regardless of who paid for such click), or a member who’s “click” you accepted and chose to answer. Before a member completed this section, allowing certain people to see certain details in his/her profile, no information about them is visible at all. Not even their screen name. One becomes a member after completion of registration, at which point they can browse the site without being visible at all. 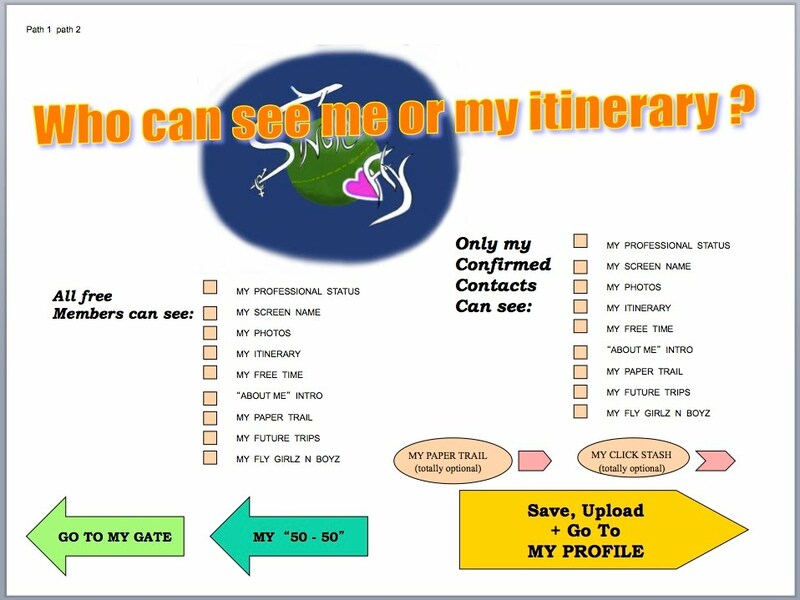 Only after completing the section of “who can see me or my itinerary” can that member be visible at all, and only to the extent that they chose. The following are the visibility choices one can allow, either his/her “confirmed contacts” to see, or “all members” to see, or both.